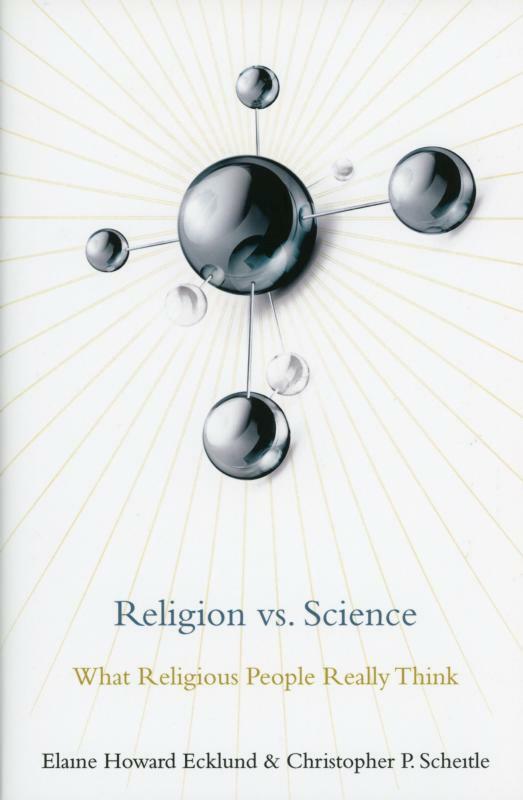 “Religion vs. Science: What Religious People Really Think” by Elaine Howard Ecklund and Christopher P. Scheitle reveals a complex and often friendly relationship between the two disciplines. “Religion vs. Science: What Religious People Really Think” by Elaine Howard Ecklund & Christopher P. Scheitle. Oxford University Press (New York, 2018). 224 pp., $29.95. If you think religion and science are mortal enemies in the United States, this book might change your mind. Based on extensive research across a wide swath of religious perspectives, it shows that the relationship between religion and science is much friendlier — and also more complex — than one might have imagined. The authors, both sociologists, spent five years studying congregants in varied faith traditions, including “white evangelical churches, historically black churches and largely immigrant mosques and historic synagogues” in the cities of Houston and Chicago. They also interviewed at length more than 300 individuals from 23 different religious institutions and surveyed a national sample of more than 10,000 to further research how Americans (religious as well as nonreligious) regard science. Their conclusions are intriguing and well supported. For example, the data suggest that “religious people do not like science” is an unfortunate stereotype. Ecklund and Scheitle discovered “similar or higher levels of interest in science” among Jews, Muslims and most Christians, as compared to nonreligious Americans. More than 31 percent of Catholics responded that they were “very interested” in new scientific discoveries, not much different from the general population. A slightly lower percentage of mainline Protestants responded similarly (just fewer than 28 percent), while evangelical Protestants were even lower (about 22 percent). However, followers of non-Western religions and those unaffiliated with a religion showed the highest percentages of strong interest, about 52 and 47 percent, respectively. Even more respondents were “very interested” in learning about new medical discoveries. Forty-two percent of the Catholics surveyed responded this way, as did 39 percent of mainline Protestants, 37 percent of evangelical Protestants and 53 percent of the Jews surveyed. These numbers rose to 50 percent among non-Western religious congregants and 47 percent among those religiously unaffiliated. Apparently, Americans of all religious traditions (as well as those claiming none) recognize the benefits of science, especially medical discoveries, and are very interested in learning more. Parsing out this interest in new scientific discoveries revealed many interesting nuances. For instance, who hasn’t heard that religious people oppose such scientific technologies as social media? Yes, the authors found that people of many different faith traditions do worry about the disconnection fostered by social media. While social media has eased interactions between people, they say, it hasn’t fostered the deeper relationships that humans need (and that are the basis for religious communities). At the same time, many congregants value how social media enables them to share their religious views with people all over the world. There are some technologies, though, that raise particular concerns among religious people, the research shows. One is reproductive genetic technologies that are related to the “screening, selection, and treatment of embryos.” When asked whether they viewed as morally wrong the “use of reproductive technologies to identify diseases in utero,” about 13 percent of all respondents agreed. The Catholic response was slightly more, with about 15 percent agreeing. When asked whether they viewed as morally wrong “using genetic engineering, that is, changing a person’s DNA or genes, to create a baby that is smarter, stronger or better looking,” more than 64 percent of Catholics responded affirmatively, not significantly different from the general population. This number rose among mainline Protestants to more than 67 percent, and among evangelical Protestants, to 72 percent. “The sacredness of human life” often came up in the researchers’ discussions with individuals about human embryonic stem-cell research. The core of religious congregants’ conflicts about this research is whether its long-term benefits to humanity is worth its inevitable cost, namely, the prevention of at least some embryos from developing. The researchers asked whether “destroying human embryos if doing so helps scientists find cures for diseases” was morally wrong. Just over 50 percent of Catholics thought it was, slightly more than the general population queried. These Catholics “frequently connected their concern with protecting human embryos to the Catholic Church’s teachings and God’s authoritative role as creator.” But when asked whether it was morally wrong to conduct “medical research that uses stem cells from sources that do not involve human embryos,” only 15 percent of Catholics responded affirmatively, just slightly more than the general population. So as religious people struggle with the conflicting interests of science and religion here, they also make fine distinctions. Personal feelings and experiences also came into play, perhaps not surprisingly. For example, those who reported personal acquaintance with others who had faced infertility issues were more likely to report positive views toward in vitro fertilization. Still, the researchers found that evangelical Protestants, Catholics and some Muslims were troubled by IVF. In general, while Catholics were found to be “slightly more likely to have problems with IVF on the grounds of church teachings,” the researchers also found many Catholics who viewed IVF favorably, recognizing how it could help infertile couples. Enriched by many anecdotes and direct quotes from interviewees, “Religion vs. Science: What Religious People Really Think” presents sound social science research gleaned from the largest-ever study on this topic. The writing is readable and well-paced, and several appendices detail the design of the research. The authors avoid claiming too much from their data but do observe that biomedical technological discoveries often advance before moral reflection about those technologies. Therefore, they recommend that religious congregations and scientists engage in more dialogue and discussion, focusing on their common ground of life’s sacredness and the alleviation of suffering. Both scientists and religious people need to transcend the myths and stereotypes, listen and learn from one another and “work together … to achieve their best and highest goals,” the authors conclude. Roberts directs the journalism program at the University at Albany, State University of New York, and has written two books about Dorothy Day and the Catholic Worker.